Interview With JangWon Lee, Creator of Korean Skincare Line, Benton Cosmetic! When I get really excited about a product, I have this tendency to immediately find the person that made it and ask them lots of questions. Such is the case with the South Korea based Benton Cosmetic products I reviewed last week, which I am crediting with getting rid of a stubborn acne invasion I’d been dealing with. I was able to successfully track down JangWon Lee, one of two brothers who created the Benton line, and with the help of a translator (Thank you, Alice of W2Beauty!) an interview was born. JangWon shared all kinds of interesting secrets with me, from the inspiration behind the Benton name to what the future holds for the brand. I hope you all find his answers as fascinating as I did! When did you first become interested in skincare? 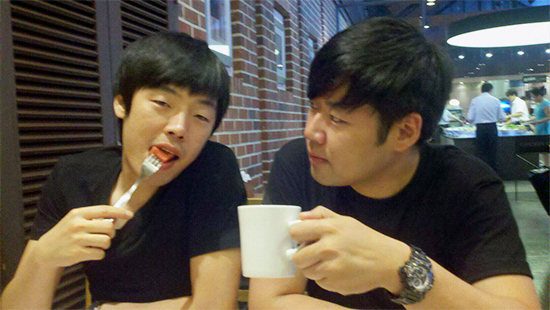 I founded Benton with my younger brother, ChaeWon Lee. ChaeWon has worked in the cosmetic industry and had experience with product creation. I have experience with managing a company. ChaeWon has a very sensitive skin type. Since he has seborrhoeic dermatitis, he couldn’t use ordinary cosmetics. ChaeWon was interested in hypoallergenic, natural, cosmetic products and gathered knowledge and experience about these types of ingredients from his work in the cosmetic industry. We started our business in 2011, launching our first product, the Snail Bee High Content Essence, on August 8, 2011. ChaeWon Lee (left) and JangWon Lee (right). This is a picture of my younger brother and me. My brother, ChaeWon, is on the left, I (JangWon) am on the right. This was in 2011, on the day we launched our first product. We had a dinner with family. I feel a bit shy. Haha. My brother is a funny guy like the cute face in this picture. This is my favorite picture of two of us. What inspired you to create Benton? Our brand, Benton, is from my inspiration. It happened when I was 34 years old. When I was 31, my weight was 87kg [192 lbs.] – mostly due to stress and drinking after work. I had a personal episode at that time, which made me realize I really needed to lose weight. I worked very hard and managed to lose 18 kg [40 lbs. ], bringing me back to my original weight. Once I got in a better shape, the desire to look good and be handsome grew increasingly stronger, as well as my interest in fashion and skincare. The real epiphany happened when I watched the movie “The Curious Case Of Benjamin Button (Korean name: ‘Time of Benjamin Button goes back’). In this movie, Benjamin goes back to his teens. There is a scene in which Benjamin Button visited Daisy’s dancing school. He was blonde, wearing jeans, and had beautiful skin. Teenage Benjamin and 40’s Daisy were staring each other – it was a breathtaking moment to see him. He was so sublimely beautiful in that scene. Benjamin disappeared when Daisy turned back for her husband’s call. It left me with a very strong impression. Later, when I was 34 years old, my brother and I had a hard time to choosing our brand’s name. I suddenly thought of Benjamin’s story and told my brother about it. After a mispronunciation of the name Benjamin Button (pronounced “Benton”), we ended up with Benton and the origin of the brand! Everyone has a desire to be young and beautiful. Let’s turn back time with a healthy product. This is Benton’s motive and motto. Your products have some very unique ingredients in them. How did you go about selecting them? Basically, we considered helpful components for people who have troubled skin. We utilized snail slime and other components to care for skin problems, and launched the Snail Bee High Content Essence. We always focus on basic skincare that won’t cause irritation, and will effectively take care of skin troubles. 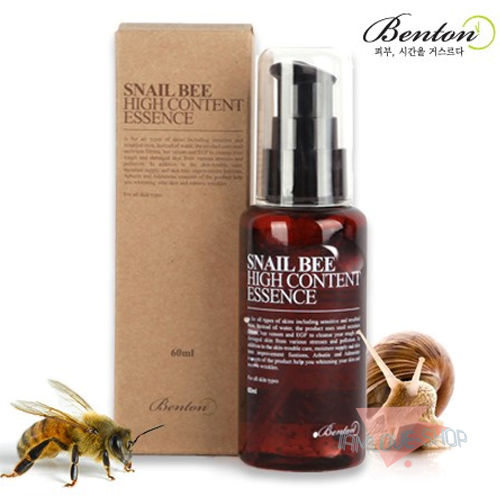 Snail Bee High Content Essence was Benton’s first product, launched on August 8th, 2011. Your product catalog currently consists of 5 products. Do you have plans to add more products in the future? Of course! They will be updated and added. First, we will create and finish the Snail Bee High Content line perfectly, and then complete the Aloe line. We also want to develop cleansers and sunscreen as soon as possible, but it’s been delayed. We regret the delay, but want our customers to know that we are working on it! What factors go into your decision to create a new product? New is important, but I will always keep it simple in everything I do. Benton wants to make products that can help people get healthy skin naturally, without irritation. This is Benton’s core philosophy. In the morning, I do computer tasks, checking the community and mail. In the afternoon, I check the orders and customer shipping processes. I manage to do my tasks on time as scheduled. In the evening, I take a rest and do personal things. Taking a rest is ESSENTIAL for body, mind and skin. When did you first realize your products were a success? It’s hard to answer because I still don’t think of my products as successful. ^^) I think that the standard of product success is ambiguous, but one thing I can say is that I feel so happy and fulfilled when customers recognize Benton’s motive and motto. If I can tell that communication with people who understand Benton’s mission is a success, then I think I’m on the starting line. I communicate a lot with people nowadays. I would go the way I have to go. Everyone draws a picture of future; I wish that Benton would be a strong brand. To tell you honestly, for example, in Korea, because of the low price, people wonder if the quality is compromised. And because we don’t advertise using mass media, people often don’t recognize our products. This can be discouraging, because it’s difficult to be recognized in the competitive beauty industry. This is a natural part of the process because there are so many untrustworthy products that come out and disappear. I think this is a big homework assignment that we have to work on with our customers. If people who understand our products’ worth increase one by one, maybe someday, we will be able to see Benton’s products in the showcases of the western countries such as the USA. We do our best and just go on. We will always do our best! 29 comments onInterview With JangWon Lee, Creator of Korean Skincare Line, Benton Cosmetic! What a great interview! Thanks so much for doing it! Now we know more about the brand ^_^ I’ve already got the toner and essence on the way to me and I really can’t wait to try them! Yeah, I thought his answers were fascinating! I was happy to hear that they’re developing more products. I can’t wait for a Benton sun cream! I’m excited for you to get your toner & essence too. I’m looking forward to reading your reviews for them! Thank you! I really love doing these interviews. People have such interesting stories! Ditto, great job on the interview! Wow, it’s such a very interesting interview – now I know more what’s behind this brand and thanks for doing it! Love the interview. Haha, they seem like such a cute duo. *w* I like brand stories that have a touch of humanity to them. Great interview. I wish these guys great success. Thanks! Me too. I love that they’re following their dream together. Thanks for the great interview. I agreed and admire them even more now. It’s true that the cosmetic industry is one the most competitive industry out there – looking at their ad spending is one indication. It’s really sad that what he said is true. People will associate price with effectiveness. I used to be like that too, but now I’m more educated with skin care ingredients, I could make more informed choices. I hope people would give brand like this a chance – so more high quality and affordable brand him could thrive. That’s really interesting insight, Annie – thank you for sharing! I’m especially intrigued by the high price=better factor. I do think that it’s that way everywhere to some extent,but what I’m most intrigued by is the difference in what constitutes a “high price” from one culture to the next. At what price point is a skin care product in Korea high enough to be considered a serious contender? Haha, Bianca! Yes, I think I have a little crush on both of these fellas. I’m looking forward to all their future products – especially the sunscreen! Yes! I am so excited for the sunscreen and I totally agree – if anyone can get that right, it’s definitely these guys. I hope we’ll see it soon! Great interview! I like it. There are so many products and we don’t know what’s the person and history standing behnd that. On the picture they look so young and already created their own product line. Very impressive! I hope I’ll find other great interviews in this blog. Thanks. Their products are very exciting, and I really want to try them out! I’m really hoping they’ll work as well for me as they did for you. Do you know if there are any offline stores in Seoul where you can purchase their products? Hi V! I don’t believe there are at this time. But who knows what the future holds for these guys? I would love to see these products in some offline stores – in Seoul as well as the US! Ah, now I’m even more excited for my products to come! I have great faith in these bothers. I hope their dreams get even bigger, as well, and they have lots of success. Even though I haven’t tried their products, I am already a big supporter. I believe in their mission statement and the quality of their products so far. You know, they recently launched the Snail Bee Lotion and Snail Bee Skin (which is a toner). Their goals of completing the Snail Bee line just came two steps close! I can’t wait for a sun cream. I’m very excited! I’m also very excited for their sun cream! I love how earnest these guys and their mission statement are. My mom is interested in using Benton because of the bee venom and snail ingredients, she’s over 60 with good skin can she use it?